Opened in February 1888, Hotel del Coronado debuted as an architectural masterpiece, acclaimed for its spectacular seaside setting and world-famous weather. Opened in February 1888, Hotel del Coronado debuted as an architectural masterpiece, acclaimed for its spectacular seaside setting and world-famous weather. Outfitted with electricity and every modern amenity, The Del was a destination resort before the term existed, attracting a wealthy clientele from the Midwest, East Coast, and Europe. These guests who arrived with their own servants in tow generally stayed for months at a time. Although seaside resorts were fairly commonplace along both American coasts during the late 19th century, few were as large as The Del or as distinctive. With its one-of-a-kind sweeping silhouette once likened to a cross between an ornate wedding cake and well-trimmed ship the resort was recognizable throughout the country and around the world. Coronado's island-like allure and year-round sunshine further ensured The Del's reputation as a standout resort, described as the unrivaled Queen of seaside resorts . this enchanting spot has no equal in America . or the world. Building The Del Hotel del Coronado was conceived by two retired, mid-western businessmen, Elisha Babcock, Jr., and Hampton Story, who became acquainted after moving to San Diego. In 1885, the entrepreneurs bought the entire undeveloped peninsula of Coronado, subdivided the land, sold off the lots, recouped their money, and proceeded to build what they envisioned would be the talk of the western world. Constructed early in California's history, well before San Diego had the materials or manpower to support such a colossal effort, everything had to be imported or manufactured on site. Architects were brought in from the Midwest; lumber and labor came from the Northwest; there was a lumber mill, foundry, and electrical power plant on hotel property; and early employees were wooed west from Chicago's finest hotels. Despite these logistical challenges, the hotel was opened after only 11 months of construction. 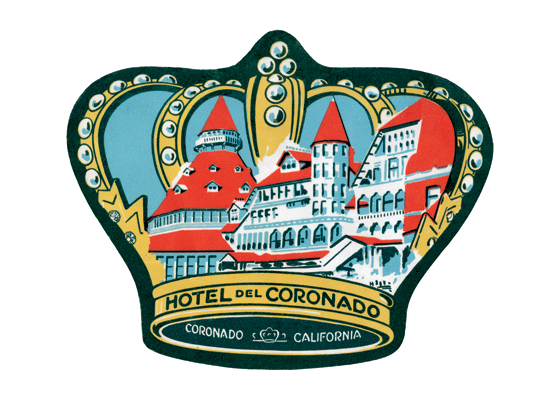 In the Beginning When Hotel del Coronado received its first visitors, California was separated from the rest of the country by vast unsettled territories. At this time, most guests traveled to The Del by train, and a trip from the east took seven days. Wealthy travelers journeyed in relative luxury, the wealthiest of whom had their own private rail cars that were hitched up to trains back east and unhitched when they reached the resort; to accommodate private rail cars, the hotel had a spur track on property. 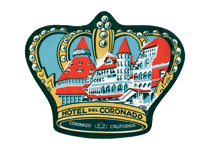 Not only was Hotel del Coronado part of the movement west, it epitomized the luxurious lifestyle of America's wealthiest families. In fact, the hotel's early patrons very likely spent their days traveling from one fabulous resort to another, following the seasons (i.e., California in the winter; New England in the summer). At one time, The Del was one of many famed 19th-century American resorts; today, it is one of the few that has not only survived, but still flourishes as a world-class hotel The Early Years Originally intended as a fishing and hunting resort, Coronado's ocean and bays were rich with marine life, and the nearby scrub was filled with quail, rabbit, and other small game (the hotel's chef would cook a guest's catch). In addition to these pursuits, The Del offered a variety of activities including billiards (separate facilities for men and women), bowling, croquet, swimming, boating, bicycling, archery, golf, and fine dining. There were also special rooms set aside for more passive indulgences such as reading, writing, cards, chess, music, and even smoking. The Del also showcased a lot of modern technology: it was lighted by electricity (at that time, the hotel was one of the largest buildings in the country to have electric lights); there were telephones (although not in the guests' rooms); there were elevators and numerous private bathrooms. There was also a fire alarm system and state-of-the-art fire fighting equipment (although it is not known to have ever been used). The hotel was outfitted in fine china and linen from Europe; furnishings came from the east. Hotel del Coronado quickly became a Mecca for sophisticated eastern travelers who had grown bored with the resorts on that side of the country and were looking for exotic alternatives to traditional European destinations.